Ford pilot new Stratasys technology for 3D printing automotive parts. How will 3D printing innovate the way Ford Motoring Company manufactures large auto parts such as car spoilers? 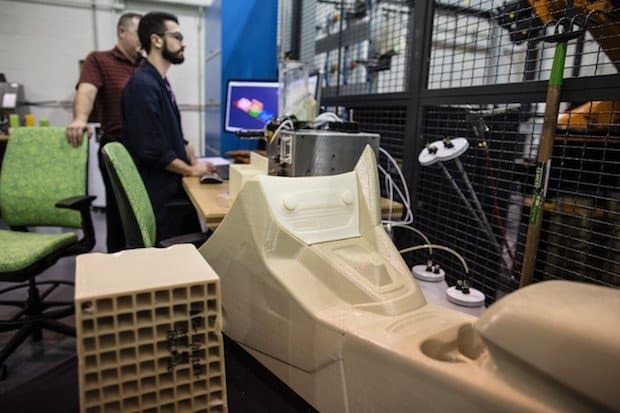 As the first automaker to pilot the new Stratasys Infinite Build 3D printer, Ford have implemented this technology in order to explore large-scale prototyping and future production methods of various one-piece vehicle parts. Located at Ford’s Research and Innovation Centre in Dearborn, the Stratasys Infinite Build system offers the breakthrough capability of 3D printing large automotive parts of practically any shape or length, providing a more efficient and affordable way of vehicle manufacturing through faster production tooling, prototype parts, and components at low volumes. This will especially benefit Ford in the manufacturing of their Ford Performance vehicles and personalisation of car parts. The wider adoption of 3D printing technology within manufacturing has been driven by recent technology advances, new areas of application and government support. Another factor in 3D printing’s popularity is its increasing efficiency and affordability, meaning that companies can employ this emerging technology for manufacturing applications spanning from industries such as aerospace to education and even medicine. As reported by the Global Industry Analysts, by 2020 the global 3D printing market is predicted to reach around £7.7 billion. Moving forward into the future capabilities of 3D printing, automotive is expected to experience incredible benefits including the production of lighter parts, aiding fuel efficiency. Lightweight 3D printed parts means that vehicle features such as car spoilers may weigh less than half of its metal cast equivalent. Furthermore, 3D printing provides manufacturers with a much more cost-efficient way of producing parts at low volumes, such as prototypes and specialised parts for race cars. By introducing the new technology to their manufacturing process, Ford will in addition be able to use the technology to make larger printed tooling and fixtures, as well as provide the personalisation so often on demand within the automotive industry.